Budding Ghallywood actress Andrea Owusu popularly called Effia Odo has been romantically linked to Nigerian singer Iyanya. 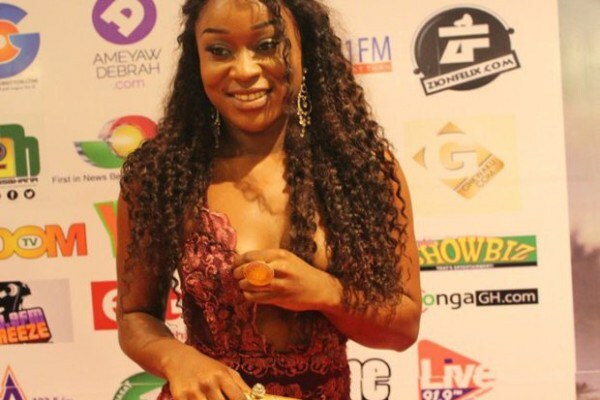 In a recent interview with Giovanni, the host of eTV Ghana’s Late Night Celebrity Show, the actress revealed that she doesn’t like wearing bras because of the size of her “oranges”. ‘My breasts are small so what’s the point of wearing a bra?’. ‘I will like the men to know what they are going to get should they approach. She reportedly met Iyanya in Nigeria back in April. Very cheap.As cheap as anything u can think of. DON’T MIND HER IT’S BECAUSE HER BREAST IS OVER HEATING! Larry Mbong and Sam, if persin is sabi run, na bad thing? You are jelosing to her bicos you does not sabi run talkless to your sister. But this girl sabi run. See her belle. See how she is stand like asaga. She come do hand like say she throway her red pant, and do leg like say na small thing make ball play. Is anygram o! One day she will sabi to run pass Wusen Bolt and she go win olempic. So she not cheap. She coss. I am also dey sure say she coss pass the two both of you pipuls weyris lambast her. She’s being real but showing sum indecencies tho! Iyanya,na do dem do you for Ghana girls?Are there no beautiful girls in Naija any more?Na waa for you ooo! As a Ghanaian myself(from the same tribe as her), I’ve never heard of Effia Odo. What type of tacky alias name is Effia Love? Anyways, if she’s with Iyana, good for her then. It’s her life, her choice. And her going about braless is also her choice. I’m guessing Iyanya is into girls from the Akan tribe. First he dated Yvonne Nelson(a Fante girl) and now Effia Odo(an Asante girl).